Greetings from Max Forton, in the lab! This week I’ll be telling you about one of the many clothing buttons we have been analyzing in the lab. In all there have been 282 clothing buttons unearthed by this project! You might ask why I’m so interested in buttons? After all, buttons may seem like pretty boring and useless things to study. Actually though, there’s quite a bit that buttons can tell us about the lives of the people of Castroville. Depending on the button we can learn about what types of clothing were being worn, where they were choosing to shop, and even about major events in people’s lives. To demonstrate the usefulness of buttons, I’d like to tell you about one of the more exciting buttons we found last fall. It is small, made of metal, with a loop attached to the back called a “shank”. This metal loop is where the button would have been attached to the garment. This button was found beneath the floorboards of one of the front rooms of the house, at the bottom of a posthole from an earlier structure. We think the first Alsatian settlers built and disassembled a series of structures in the 1840s/50s before finally building the house that sits on the site today. The posthole where this button was found is from the earliest structure built on the site. This particular button is made in manner that dates to the late 1700s to early 1800s. Rather than being two pieces soldered together, the button is made from a single piece of metal. It seems probable that the person wearing it would have been among the first settlers of Castroville. This is further supported by the button being found at a bottom of a post hold from a possible early structure. The button may have even come directly from Alsace! This would make it a unique item that was present for the founding of the Castroville community. Thus an object as small and everyday as a button is simultaneously a window to an important chapter in the history of Castroville. Greetings this week from Erin Whitson! The lab was a pretty happening place this week, with a lot of undergraduate volunteers in and out of the on a pretty regular basis. It’s exciting to have so many people interested in doing the lab work behind the scenes. It gives us a chance to work more quickly through some of the materials, which means we have a better chance at catching the unexpected once and a while. The artifact of the week this week reflects this. The artifact—a small fragment of Mexican redware ceramic about the size of my thumb – at first glance is underwhelming. You’re probably wondering what’s so cool about a small reddish-brownish piece of broken ceramic?! I find it interesting, first of all, because of its origins – southern Mexico! In a time where most people in the United States were getting their cups, bowls, plates, and storage vessels from ceramic plants in the east (especially Ohio and Indiana), from Europe (mostly from England), and from just down the road (we have locally made stonewares in the collection too…but that’s for another day) those living on the property decided to also include ceramics from a non-traditional international source—Mexico! I also find it romantic to try to imagine how this bowl (probably a mixing bowl or something of that nature) made its way here. Did it gradually get here by transferring hands/sellers until it eventually settled down in Castroville? Did someone from Castroville go south to where it was made, seeking out Mexican redwares for their particular flavor of decoration? Was it brought back as a souvenir of a trip to Mexico? I have no idea which of these is most likely to have been the case, but it’s fun to take five minutes out of the day to picture the various journeys this object may have taken to reach its final destination. The last (and my favorite) reason that makes this piece so interesting (to me at least) is because of its visual similarities to ceramic redwares from Alsace (for an example, see the photos below…an eBay search produced two incredibly similar plates). Most of the immigrants making their way from Alsace to what later would be Castroville would have been very limited in what they could and could not bring with them. We haven’t seen any ceramics so far, that likely came with Castroville’s founding families from Alsace. We haven’t seen any ceramics so far that appear to have been shipped from Alsace to Texas after they settled the area. That makes me wonder if those living on the property buying this type of ceramic because it looked like the redwares in Alsace? Or did they buy them because they just liked the way Mexican redwares looked? We don’t know…but it’s an interesting thought! If you have any insights to these questions, or stories of your own…please share them with us! The beautiful (and challenging) part of looking at material culture is that it reflects choices that people in the past made. The remnants of people’s everyday lives that we deal with in the lab make up networks of these choices. These networks reflect, hopefully, how they might have been looking at, or interacting with, the world around them. Artifacts, such as ceramic fragments or glass shards, linoleum tiles, and rusty bits of metal that we collect while doing archaeology immortalizes the choices people living here were making…and in a weird kind of way, this immortalizes the person/people who made them. It gives those of us in the present a way to connect with people in the past on a very personal level. We’re getting in their heads…and letting them get into ours. Even though we’re not in the field, there is still a sense of discovery that happens during lab work. When we’re digging, most things go right into a labeled bag to await processing – weeks or months later, we open them, and discover them all over again. It can be (and has been) a lot of fun – though also a lot of work! This past week, our student volunteers have been working their way through a specific type of artifact – textiles and other perishable materials. We’re lucky to have found these things at all. In most cases, things like fabric, paper, leather and wood are the first to go when buried in the wet ground. 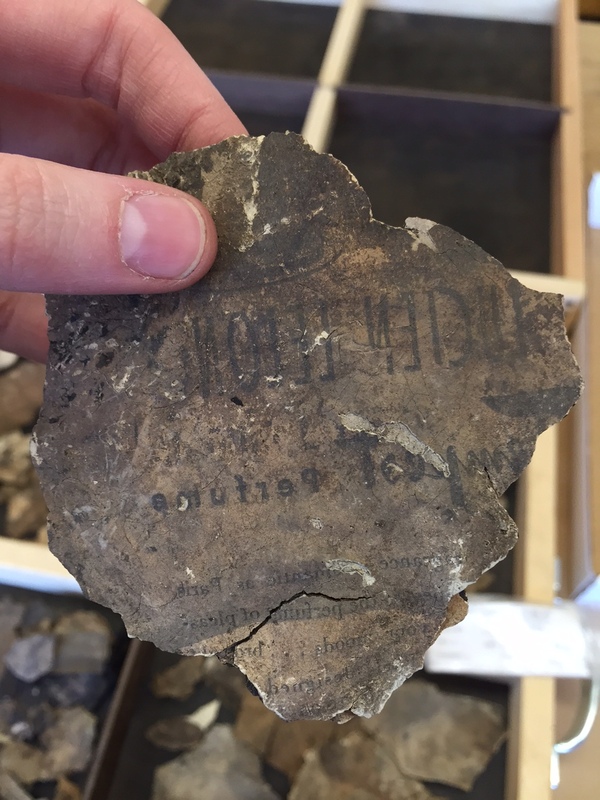 In these cases, some environmental factors allowed them to last decades, and so we are able to handle them (with extreme care) in our archaeological laboratory in Binghamton. These are two pieces of soft leather that appear to fit together. They would have originally formed a square, and have a shape cut out from the center. We actually don’t know what the exact purpose of this leather would have been – if you do know or have any ideas, please leave them in the comments section! Here we have some examples of newspaper that was used to paper walls. It is still attached to the plaster-like material that would have held it there, and in some cases it has other wallpaper or paint layered over top. We’ve been able to make out some of the print on the newspaper, including a piece that seems to say “San Antonio Evening News,” a crossword puzzle, a piece of the cartoon section, and an ad for Lucien Lelong perfume. You’ll notice that the perfume ad is actually backwards (and one of our students had the great idea of using a mirror to see it properly). We have text showing up both ways, but it’s possible that this backward text is a case where the ink of the paper transferred to the surface of the wall, and remained even after the paper decayed. One of the most exciting things about historical materials is that we can recognize them – they trigger associations and memories with our own experiences or stories that we’ve heard. If you see anything that you recognize, or that you have more information on, please share with us in the comments section! This past week has been incredibly busy, but unfortunately not in a way that makes for particularly interesting blogs posts (a lot of organizing, numbering, printing, and bagging – very important work, but not the stuff of stories). As the semester goes on and we get into cataloging, things will pick up – but in the meantime, I figured we could catch up on some of the exciting things that happened LAST semester. 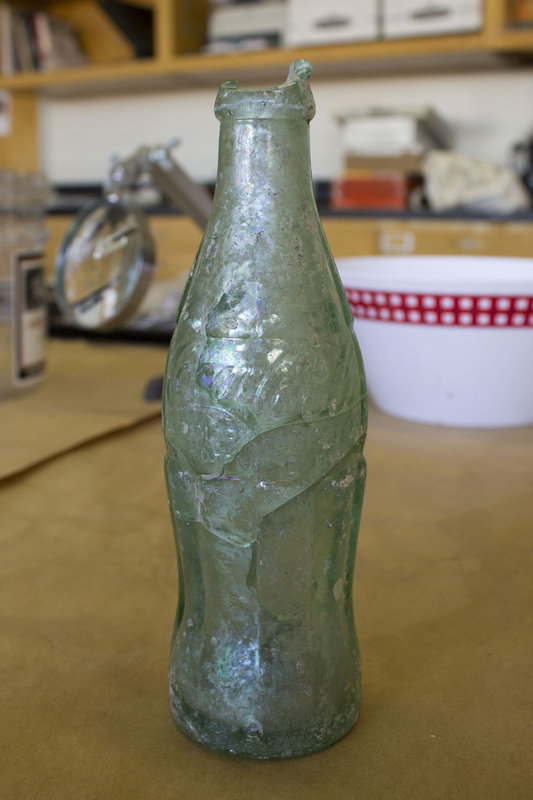 In particular, I’d like to talk about our work on the bottle and glass assemblage from Feature 9, which was a slack-lime pit excavated in 2014 behind the house (some of you may remember the Binghamton students out there digging it!). Three graduate students from Binghamton teamed up in the fall to analyze the collection, which included almost thirty whole (or mostly whole) bottles – and a whole lot of glass besides. 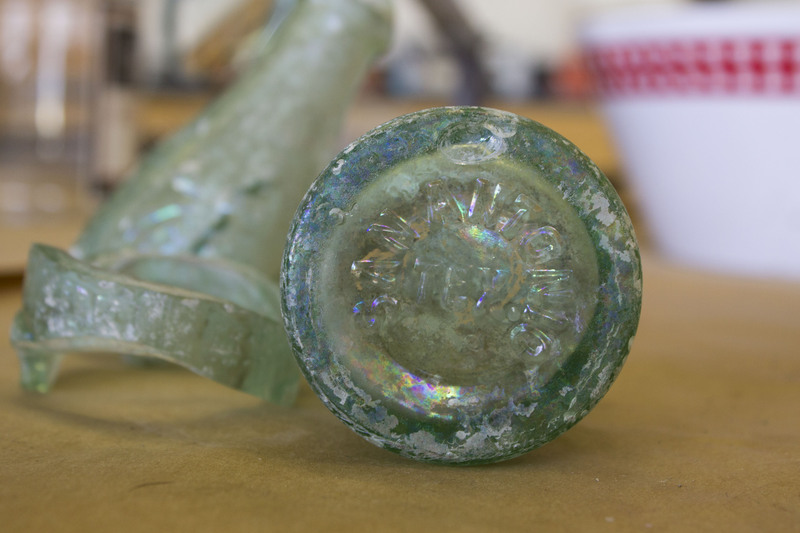 Having small pieces – what we call sherds – of glass is extremely common for historical archaeology. 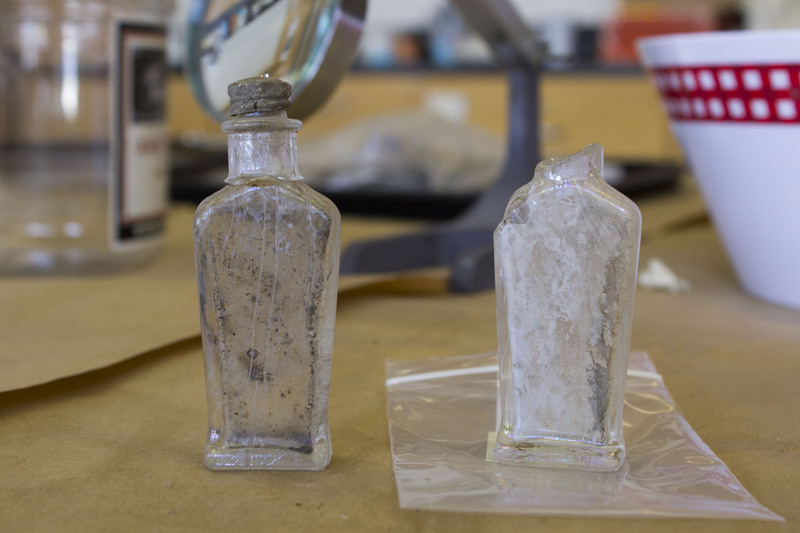 What was so great about this particular assemblage was just how many whole bottles we had – this lets us look for important details that clue us in to how, where, and when they were made, as well as what they were used for. 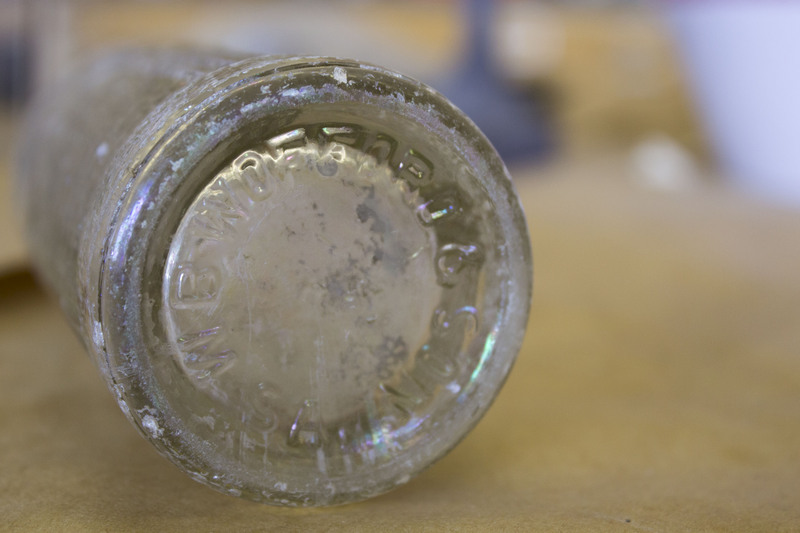 It may come as a surprise to some, but there is actually a lot that we can learn about the past from glass bottles. Kellam, a second year graduate student, analyzed where the many of the bottles were coming from – sometimes as far away as the east coast. By looking at this, he was able to get an idea of the different trade networks in place around Castroville during the early 20th century. Paula, another second year graduate student, looked at what types of things people were buying at the time (right around the 1920s-1940s) and what that said about consumption patterns and habits. 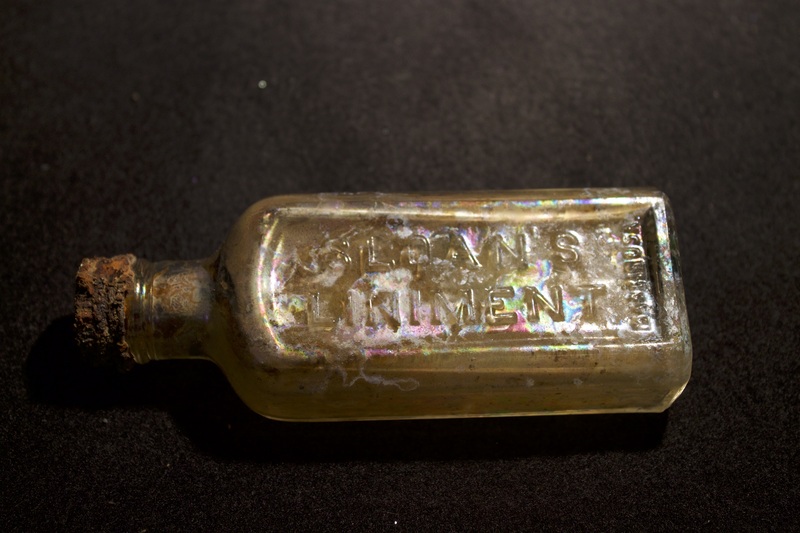 I (Trish) looked at different ways we can interpret bottles to think about lived experiences in the past – for example, what a medicine bottle might tell us about someone’s health and the side effects they might have experienced from taking the medicine. This is just a very short overview of all three projects, and we will certainly be posting more about our findings. For now, I’ll include a few pictures of some of the bottles we encountered throughout the semester so y’all can see what we’ve been working with! Let us know what your favorites are! Any one of these bottles can be a blog post all it’s own (and there’s a good chance they will be!). Two toilet water bottles – we actually had nine of these exact same ones! Everyone knows this one! 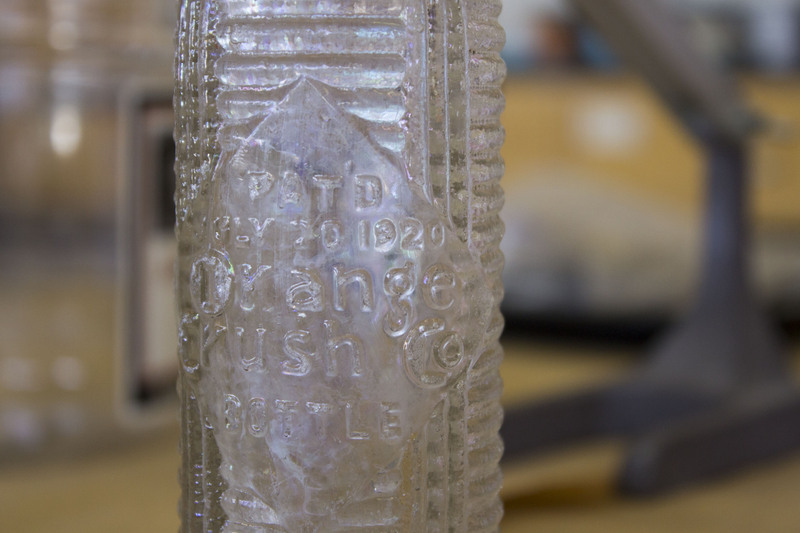 This Coca Cola bottle is the style that was introduced in 1919, though it probably dates to a little bit later than that. Hello from southern tier New York! There are about 2000 miles between us and Texas, but that’s no reason we can’t keep y’all up to date on what’s happening during our off-season! Here’s a quick version of what usually happens when we leave the field – once excavations are done, we head back to our lab to wash, analyze, and catalog the artifacts from the excavation, a long and laborious process that involves a lot of scrubbing with toothbrushes, matching small pieces, entering data into computers, and putting things in bags. It may not be as glamorous as excavation (for those of us that find being dirty glamorous), but it is exciting in its own way – mainly because we get to learn about the artifacts and delve into what they can tell us about the past. This blog is a way to share what we’re doing with everyone in Castroville. We’ll post photos of the artifacts and let you know what we’re learning about them, tell you about what life is like in the lab, and keep you up to date on our thoughts and plans. But that’s only half of it – we’d like to hear from you what your thoughts and ideas are on this process. Let’s make it a conversation. So please, leave comments, email us, and let us know what you find interesting! We’re also excited to post guest blog posts, so if you have an idea, write it down and send it our way. We have some awesome undergraduate volunteers this semester, and will be working on finishing up washing all of the artifacts from 2014 and 2015 (they’re already hard at work on this, and it’s only the third week). 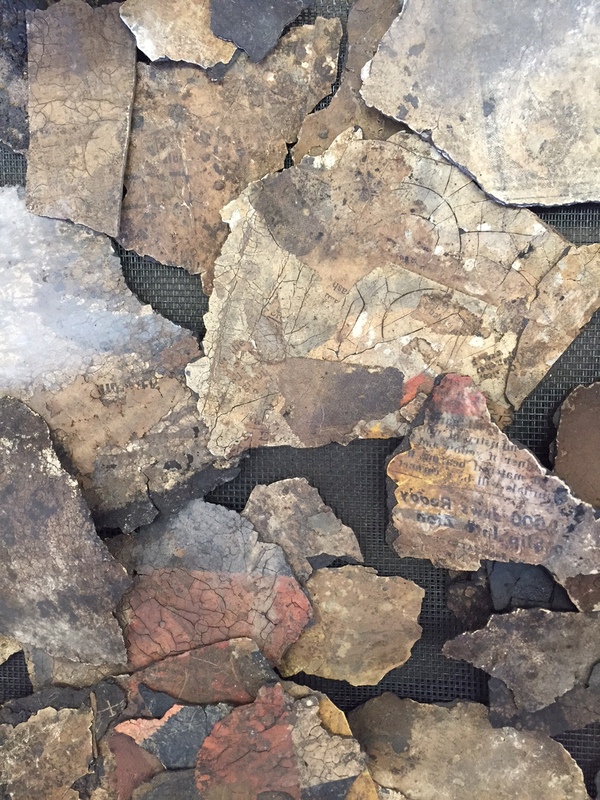 We’ll also be spending a lot of time cataloging – entering all the data about the artifacts into a computer – so as we work our way through things systematically, we’ll post photos, info, and stories about the cool things we find.